Do your parents understand you? 1 Listen to the words and expressions and repeat them after the speaker. It occured to me.— Мне пришло в голову. 2 Express the same idea in a different way. Use the expressions below. 1. Some boys at school are ignoring me. 2. I never thought about it before. 3. My parents often nag me about my friends. 4. We talked about it but we couldn't agree. 5. My sister's behaviour made me feel uncomfortable. 6. My parents are very angry because I was late again. 7. I want my parents to leave me alone. 8. I don't want to do any housework. It's a waste of time. 9. I've had enough of my older brother. 3 John has written about his problem to his favourite magazine. They published his letter, but they didn't answer it. The magazine wanted the readers to answer John's letter. Read through the letters in Ex. 4 and find John's. What does he do on Fridays? 4 Now read the other teenagers' letters in detail. What do teenagers complain about? Give each letter a suitable heading. 1. I'm fed up with my parents. They always tell me what to do but they never listen to me. All they want to know is whether I've done my homework and chores. When I want to talk to them, Mom tells me to go and ask Dad, and Dad tells me to go and ask Mom. They give me enough pocket money and buy me nice clothes, but I'd like them to pay me more attention. They're never there for me. Help! 2. My parents control my life. When I make a new friend, they want me to bring him or her to our flat straightaway. If I want to go to a party, they lecture me for days about how I should behave and when I should come home. Even if I promise to come home by nine, they still phone me every hour to check where I am. They embarrass me in front of my friends. When my phone rings, my friends know exactly who it is and call me a mommy's boy. What should I do? I don't want to disobey my parents, but maybe I should? How do I explain to my parents that I'm fifteen, and they shouldn't treat me like a child? 3. My parents want me to go to university and make a lot of money. They have a strict plan, which I have to follow. They make me stay at home and study all the time. At weekends my friends go to clubs or to the shops, but I can't go out. I have to study. When I try to tell my parents that I'd like to spend some time with my friends, they refuse to listen. They say that all my friends are losers. I understand that they want the best for me but they have to understand: I want to live my own life and make my own choices. They expect me to earn a lot of money, but there's more to life than that, isn't there? 4. My mom is normally cool with most of the things that I do. She understands that I need my own space. She has nothing against make-up and she likes all my friends. Last month I introduced my boyfriend to her and she was great. My boyfriend was really impressed. The only problem I have with her is when I want to come home late. All my friends go to clubs and stay out until ten thirty, but I have to be home by nine o'clock, so I miss all the fun. If I'm ten minutes late, she gets mad with me and nags me for days after that, what can I do? 5. All of my friends get a lot of pocket money and spend it on anything they want. But my parents are against pocket money. They buy me fashionable clothes and other things that I need, but they refuse to give me any money. The situation is very embarrassing. So I decided to earn my own money. I found an evening job, but my parents were against it. They said I had to study and do sports after school and not work in the evening. That's fine, but I'm nearly fifteen and I'd like to me more independent. So I started work in our local McDonald's. I worked on Friday evenings and told my parents that I'd been at the disco. Everything went fine until one day I came home late. One of the other workers at the restaurant was ill and I had to do his job for him. I was very busy with the customers, so I couldn't phone either. My parents were very angry, but I promised not to be late again. Unfortunately, on the Friday after that something happened again, so I was late again. Now my parents are very angry with me. They don't let me out any more. What should I do? 5 Sometimes both teenagers and their parents send letters about their problems to the same magazines. Read through the letters from the parents and match them with the letters from their children. I have to know where she is and when she'll be back home. In my time, streets and parks used to be safe places, but nowadays they aren't any more. The newspapers and TV are full of terrible stories about kidnapping. So every time my daughter comes home late, I worry. I try to talk to her about it, but she doesn't understand. to make his own decisions. Of course, we do everything for him and always buy him what he wants, but he looks always unhappy. We don't know what to do. c) Our son is very clever but he's not ambitious enough. He has to work hard if he wants to get a good education and have a successful career, but instead he wastes his time with his friends who couldn't care less about studies and school. All they want is to enjoy themselves and have fun. It's obvious that they will never achieve anything in life, but our son is different. Since the day he was born, we've given him all our attention. We wanted him to have a better life and achieve more than we have. All these years we have been saving money to pay for him to go to university and we think he should be grateful for that. d)Our son is the centre of our life and we try to do things together with him. We trust our son, but he's so young and he doesn't have any experience about life. We try to give him advice about how to behave and how to make friends, but he reacts negatively to this. He says that all his friends laugh at him because we phone him so often on his mobile phone, but it's important for us to know where our son is. It drives us mad when we think about what could happen to him. We also think it's nice to let our son know that we think and worry about him. 6 Parents and their teenage children often use different words and expressions when they talk about the same things. Use the parents' and the teenagers' letters to fill in the table. Our son is angry with us. They're never there for me. My parents control my life. We try to do things together with him. They lecture me for days about how I should behave. They embarrass me in front of my friends. My parents want me to go to university and make a lot of money. All they want is to enjoy themselves and have fun. They say that all my friends are losers. I try to respect my daughter's views, tastes and friends. There are some things that I can't agree with her about. She gets mad with me. She nags me for days after that. 7 Compare the pairs of letters again and write a summary of each problem. Use the complex object. 8 Answer the questions about John's letter and analyse the conflicts. (See Ex. 4, Lesson 1). 1. Do you think the parents know about their teenager's problems? 2. Do you think the teenager knows about the parents' problems? 3. Is a compromise possible? 4. What kind of compromise would you suggest? 5. Can the parents change their behaviour? What should they do? 6. Can the teenager change his / her behaviour? What should he / she do? Don't just expect your parents to understand you. If they don't, it could be your fault. It's very important to learn to communicate effectively. Here are some phrases that we often use in arguments. 9 Listen to the expressions and repeat them after the speaker. Discuss which phrases would help to build bridges in a conversation? Which phrases would burn bridges? 1. "You don't need to know about that." 2. "What do you think about it?" 3. "Would you like to talk about it?" 4. "I'm fed up with..."
5. "You always say that!" 6. "That's a good question." 7. "I couldn't care less!" 8. "Thank you for saying that." 9. "Why are you asking me that?" 10. "I can understand that, but..."
11. Go and clean your room. We need to talk about something important. 12. "If you say that again, I'll..."
13. "Your feelings are important to me." 15. "It didn't occur to me." 16. "Please explain it to me again." 17. "Go and ask your father / mother." 18. "What I'm saying is very important to me." 20. "I deserve it because..."
21. "You'll understand that when you're older." 22. "That's none of your business." 24. "I think I have overreacted." 10 John has decided to talk to his parents. Listen to the first conversation. Did they reach a compromise? Why? / Why not? 11 Read the second conversation and answer the questions. 1. Did they reach a compromise? 2. What was the compromise? 3. What bridge builders did John and his parents use? 4. Did they use any bridge burners? Did it ruin everything? Why? / Why not? 5. How should one react to bridge burners? How shouldn't one react to bridge burners? Mom: Why don't we just sit down and talk? Dad: OK. That's a good idea. I think I've overreacted. So what was it about the pocket money then? John: Well, let me start by saying that this is very important to me. I have to admit that I lied to you because I didn't know what to do. John: You didn't give me any pocket money and you didn't let me have a job either. So I decided to find myself a part-time job. All this time I've been working in McDonald's, and on Fridays they always have a lot of customers. That's why I was late. Mom: But that's awful. Working in McDonald's is a waste of time! John: Mom, please. It really upsets me when you say that. Mom: You're right. I'm sorry. But why did you do that? John: Because I wanted to have my own money. Dad: But we buy everything you need. What haven't you got? John: I didn't want to ask you for money every time I needed something. Dad: I understand that, but we've never refused to give it to you. John: Yes, but I wanted to be more independent. It's important for me to make my own decisions and plan how I'll spend my money. Dad: That didn't occur to me before. Mom: Your feelings are very important to us, but what about school? You've had a lot of bad marks in the last couple of months. Dad: Yes, it's really not good enough. John: Please give me a second chance I really deserve it. I've never had bad marks before... you know that. Dad: I think we can reach a compromise. You can work three evenings a week - on Friday. Saturday and Sunday. What do you think? John: That's great. Dad! And I will get better marks. I promise. A a) Sometimes people get upset with each other not because of the words, but because of the meaning behind the words. Read the phrases and answer the questions. 1. Which of the phrases do you hear from your parents most? 2. Do you agree with the meaning of the phrases? 3. If you don't, what do they mean when your parents say them? 1. Are you going to wear that for your grandma's birthday party? — We're not letting you leave this room in those clothes! 2. How was your day today? — Did you do anything bad today? 3. Go and clean your room.— We need to talk about something important. 4. Have you done your homework yet? — When you are not busy with anything, it gets on our nerves. 5. Who's the boy (girl) who phoned you? — We'd like to meet him (her), and talk to his (her) parents before you go out together. 6. Your friend Kate is really nice.— I can't stand your friend Mary. 7. We got a call from the school today.— Are the teachers going to complain about you again? 8. Will your friends' parents be at home? — Do you really expect us to go to sleep before you're back home? 9. Whose turn is it to do the dishes? — It's your turn to do the dishes. 10. How much did you pay for that?! — You'll get no pocket money this week. You'll understand when you're older.— We don't know how to explain this to you. 11. 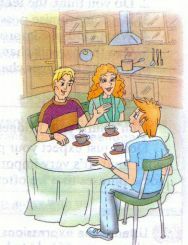 We expect you to get good marks in your exams.— You should study for your exams instead of having fun with your friends. 12. Do you really think that suits you? — We think it looks awful. 13. Do you think money grows on trees? — Get a part-time job. 14. Shouldn't your school report be here by now? — Where have you hidden it? 15. Be nice to your little sister (brother).— One more fight and we'll go crazy. 16. We know that you're a good boy / girl and would never do anything bad.— We don't trust you at all. b) Write your own pairs of phrases from your own family or your friend's family. В Fill in the gaps in the conversation with your own phrases. You can also use phrases from the Conversation bricks. Girl: Mom, I'd like to talk to you about the party tomorrow. Mom: I think we've already discussed that and the answer is "No". Mom: What makes you think that you deserve to go? Mom: Well, that's all very nice, but I've already told you that you can't go this week. If you behave yourself, I'll let you go next time. Mom: Well, I really don't know. Go and ask your father then. Mom: ...You'll understand when you're older. С Write about any problem that you or one of your friends / relatives had with their parents. How was the problem solved? He looks very strict and cold. He wears suits and always does everything perfectly. He doesn't understand you very well. If you like something, he doesn't; he can't stand some of your friends and they're afraid of him. He always wants you to achieve more and get better marks. Secretly, he's proud of you and will do anything for you. Sometimes you feel like you come from different planets, but one day you'll find out that he is your most reliable friend and you're not so different. Your father has both feet on the ground. He sometimes doesn't have enough time for you, but when he does, you always do something interesting and fun together. He knows how to do a lot of useful things and is always glad to show you. Just listen to his advice and you'll never get into trouble. He always knows what to do and you can feel safe with him by your side. Deep inside your father is still a boy who is always ready for adventure. He has a lively imagination and knows hundreds of different games. All your friends think he's great. He always has a lot of interesting and exciting ideas, and he is often the first to break the rules. He sometimes gets into trouble, but with a friend like you he doesn't have to worry. So don't get upset if sometimes he flies away and you have to wait by the window. He'll always come back. К. И. Кауфман, М. Ю. Кауфман Английский язык: Счастливый английский.ру / Happy English.ru: Учебник англ. яз. для 9 кл. общеобраз. учрежд.— Обнинск: Титул, 2008.— 288 с: ил.